Though many people dread Mondays, I find myself looking forward to them, as they bring yet another Diva’s Zentangle® challenge. Even though I am working my way through all of her earlier challenges, I find myself waiting to see what each Monday will bring. This week was the a star challenge, and as I had just done a star in my redoing the early ones I was at a bit of a loss. 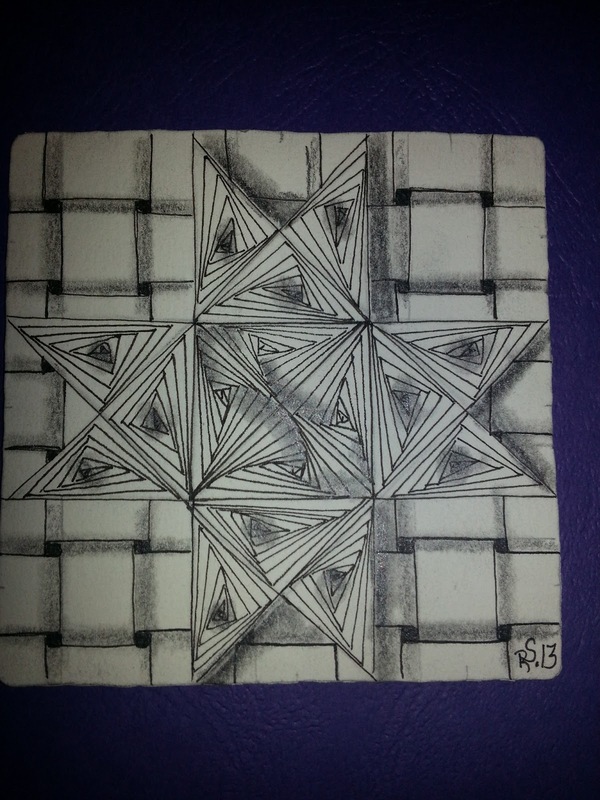 I hear star & Zentangle, and I think Auraknot. As that is what I did for the 1st star challenge, and was this weeks adventure, I decided I should go a different direction. I love Paradox, and the triangles of the Ohio Star was perfect for them. I put it on a simple background of W2, and I am pleased with the results. Wonderful design, and I'm amazed at how even your lines are! Great shading. Well done! Two of my favorite patterns. This is a good example for 'less is more'. I like it. Auraknot and paradox both make great stars and your paradox version is gorgeous! Stunning, it is so 3D it loks as if I could pick it up from the paper! !